It’s not often that a locally focused historical magazine, a quarterly with a tiny circulation (240, give or take), can spark an honest attempt at censorship. But Volume 55, No. 3 of The Dearborn Historian appears to have done just that. That’s what Historian editor Bill McGraw was told earlier this week. He’d known the mayor was unhappy with the cover, which featured a photo of Ford and a particularly rancid quote from the Dearborn Independent, Ford’s weekly. In fact, O’Reilly ordered a new cover be printed, without the quote, which said: "The Jew is a race with no civilization to point to, no aspiring religion, no great achievement in any realm." McGraw said he understands the entire issue will be tossed. As a publication of the City of Dearborn, the mayor holds that privilege, McGraw said. Neither the city’s public information officer, nor McGraw’s supervisor at the historical museum, returned calls for comment. Ford’s anti-Semitism was never a secret, but McGraw’s story turns up information that may have been forgotten in the mists of time: That Adolf Hitler considered Ford “an inspiration,” for one. That writings in the Independent, none by Ford himself but evidently approved by him, were published in four books, collectively titled “The International Jew.” That the decision to publish without copyright has allowed them to flourish for nearly a century. And in particular, that the Internet has given them a new life; excerpts appear on white-supremacist websites to this day. 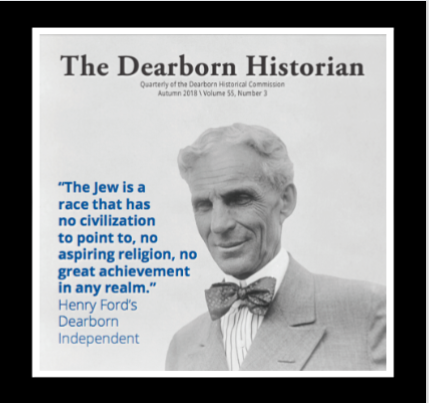 McGraw said he told members of the city’s historical commission that he was writing about the centennial of Ford’s purchase of the Dearborn Independent for the current issue. No one ever pressed for more details, and he didn’t offer any. Dearborn has dealt before with less-flattering aspects of its history. In fact, O’Reilly has been instrumental in telling the full story of the city’s former (now deceased) mayor, Orville Hubbard. Hubbard, an outspoken segregationist, was once honored with a statue outside city hall. Today, that piece stands in a far less conspicuous place outside the Dearborn Historical Museum, with accompanying materials explaining his role in the city’s history. Ford’s history of anti-Semitism is part of the collection at the city’s library. The materials McGraw used in his research are all publicly available there. Meanwhile, the Dearborn Historical Commission is meeting in a public, “emergency” session on Thursday at 6 p.m.